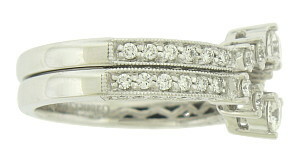 These 14K white gold wedding band brackets are each studded with .25 carats total weight of diamonds and five diamonds of graduated size. 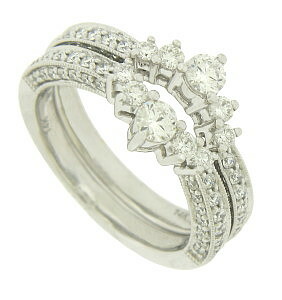 The rings are shown here with engagement ring R3859 (sold separately). 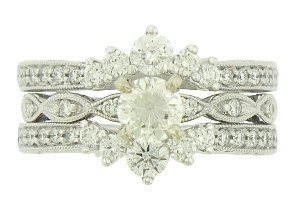 As wedding or anniversary bands the guards are the perfect accents to engagement rings. With the curve, the brackets measure 5.3mm in width. Size: 6 1/2. We can re-size. 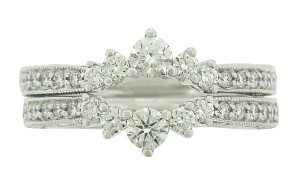 The bands are frequently purchased as a set for $3420.00 but they are also available individually.